Mirco is a blind boy who refuses to accept his limitation. However, his teacher Don Giulio (played by Paolo Sassanelli in the film) uses a technique known as “reframing” in Neuro Linguistic Programming (or “restructuring”) to move his attention from the problem to the solution: “I can see too, but that’s not enough for me” ….. “ You have five senses, Mirco. Why do you want to use just one?” The objective of Don Giulio was to move the boy’s attention to the usefulness of his other senses, and he manages to do so without diminishing his sight, or talking about the problem. I do not intend to go into in-depth technical explanations on reframing, even though I am an expert in NLP,I will leave it to my colleagues. I would, however, like to focus on the extraordinary possibilities that the Cinema offers to show the technique, give an example and make it means of learning for your audience. Imagine trying to explain reframing. How much would you have benefitted from showing this scene? If you were a manager training your employees on the finding opportunities instead of problem, how useful would it be to you to show this movie clip? 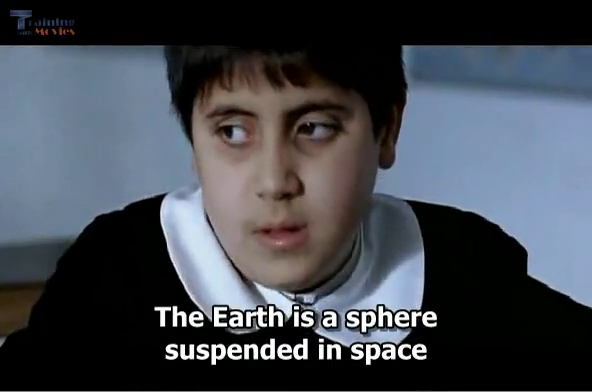 When I saw this scene for the first time, I realized that from then on I would analyze and find teaching in films. My initial study was too see how much material there existed on internet, but I was surprised at my findings. For example, I found that some blogs merely touched on the subject and the films supporting the articles were hardly quoted. Those that did have examples from films didn’t have links to the scenes. As if that were not enough, the material used to reinforce the message was almost always the same. From “Any Give Sunday” to “Dead Poets’ Society” and “Coach Carter”. These are masterpieces but when their use becomes so abused it becomes counterproductive. As a matter of fact, I realized that the more famous were the scenes, the less they influenced processes of communication. Dear Friend, if you have found this blog interesting, download the “special report” and watch the other scenes, here. You have all my admiration for being a curious person wanting to improve yourself. By sharing your discovery of us with your friends you will contribute in spreading our mission: “make man greater through films”.